In a large-scale single industry case study, insights are provided into corporate governance factors affecting innovative capacity in the superannuation industry in Australia. Analysis of the data indicated that the major corporate governance factors driving innovation in the industry included: ‘possessing a progressive organisational culture’, ‘emphasis on marketing-orientation’, and ‘engaging in co-opetition’. 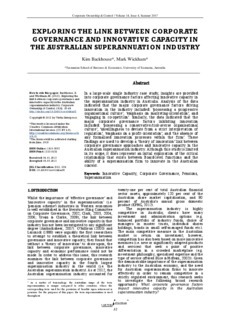 Similarly, the data indicated that the major corporate governance factors inhibiting innovation included: ‘possessing a conservative/risk-averse organisational culture’, ‘unwillingness to deviate from a strict interpretation of regulation’, ‘emphasis on a profit-orientation’, and ‘the absence of any formalised innovation processes within the firm’. These findings are used to develop a ‘theory of innovation’ link between corporate governance approaches and innovative capacity in the Australian superannuation industry. Although this study is limited in its scope, it does represent an initial exploration of the critical relationship that exists between Board-level functions and the ability of a superannuation firm to innovate in the Australian context.